Sometimes closed due to wildfire conditions, usually open year-round. Snowpacked during the heavy winter months. Rattlesnakes have been spotted on Devisadero Peak and the trail during the past two years. The stone chairs and the large cairn that were on the summit have been disassembled after a rattler was heard inside the cairn by a Forest Service employee. Devisadero is a moderately technical trail and is usually rideable from April until November, or earlier/later during a dry year. The trailhead is across Highway 64 from the El Nogal parking area, a few steps east of the Taos welcome sign. It begins with a steep climb up the arid mountainside amid pinon and juniper forests. 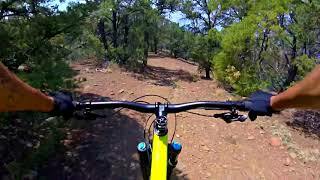 The first half mile indicates the nature of the rest of the trail; rocks and obstacles create technical features between short smooth sections of classic New Mexico singletrack. Some hiking is necessary for all but the super-fit. At 0.1 mile the trail graces a power line cut, then crosses this cut at 0.2 miles, then at 0.6 miles the trail splits. There is a sign here and this is where the loop begins. The eastern route (to the right) ascends the southerly aspects of Devisadero Peak; this side is steeper, rockier, and provides a more direct route to the summit via a series of loose switchbacks. The western route is longer and slightly less technical (a more rideable trail) as it meanders through douglas and white fir forest towards the summit. Riding the loop either way will yield a modest amount of smooth singletrack, enough technical terrain to keep an expert rider happy, and will require some pedaling during the descent. There are several scenic points along each side with views of Taos and the Rio Grande valley to the west, and Taos Canyon to the south. The trail tops out close to 8,300 feet at the top of Devisadero Peak. This flat summit is a great spot to rest on the stone thrones and watch the butterflies and small forest creatures do their thing, while preparing for the descent. When riding the loop counterclockwise the junction with the North Boundary Trail #495 is 0.3 miles down from the summit. Watch for a Forest Service sign here where the Devisadero Trail makes a sharp left turn and the North Boundary continues to the right. As with most trails close to town this one is heavily used by hikers so be ready to check your speed, as visibility is limited by trees and sharp turns and the faster sections have scattered rocks and roots embedded in the ground. There is no water along the route, and it gets hot during the middle of the day.